A team from the University of Pennsylvania’s Wharton School of Business took the top prize in the 2017 Energy in Emerging Markets Case Competition, an annual event held at Duke University’s Fuqua School of Business. 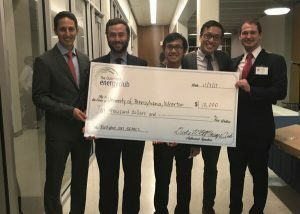 The team, which beat out 33 other teams from 19 schools to win a $10,000 prize, included students Karl Chan (MBA/MA International Studies ’19), Le The Huy (MBA/MA International Studies ’19), Michael Alexander (MBA ’19), Miguel Cebrian (MBA/MA International Studies ’19), and Tommy Witmer (MBA ’19). Second place in this year’s case competition went to a team from Cornell University: Crosby Fish (MBA ’18), Madeleine McDougall (MBA ’19), and Seth Olson (MS Applied Economics ’18). A University of Michigan team took third place, including team members Bhuvan Neema (MS Sustainable Energy Systems/MS Mechnical Engineering ’17), Eric Krostich (MBA/MS ’19), Ayush Awadhiya (MBA ’19), Amanda Willis (MBA/MS 2020), and Snehal Chopade (MS Natural Resources & Environment ’18). Now in its fifth year, the Energy in Emerging Markets Case Competition presents graduate students with a unique business challenge related to bringing power to the developing world. In this year’s case, participants were asked to come up with a strategy for East African social entrepreneurship company M-KOPA Solar to shape the off-grid regulatory landscape in Kenya and assess the company’s business model. After a first round of written submittals, 12 finalist teams were selected to come to Duke to present in person to a panel of judges during Duke’s Fall “Energy Week.” Besides the three winning teams, the finalists represented schools including Carnegie Mellon, University of Chicago, Duke, Hong Kong University of Science and Technology, University of Maryland, Rice University, Rochester University, UCLA, and Yale. The Duke MBA Energy Club organizes and manages the annual competition, including recruiting judges and sponsors, and authoring a new business case each year. You can read more about the competition on the Energy Week at Duke website.